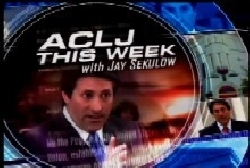 MEDIA ADVISORY, July 21 /Christian Newswire/ -- ACLJ THIS WEEK with Jay Sekulow is a fast paced, informative weekly television news program that examines the most critical legal, political, and cultural issues of the day. Hosted by renowned constitutional attorney Jay Sekulow, Chief Counsel of the American Center for Law and Justice (ACLJ), ACLJ THIS WEEK features thought-provoking analysis on legal, legislative, and public policy issues from Washington, the nation, and around the world. Guests include key elected officials, prominent political analysts, and the best legal minds in public policy. Visit www.aclj.org. This week Chief Counsel Jay Sekulow joins ACLJ’s Deputy Director of Government Affairs Jordan Sekulow behind the scenes from inside the ACLJ radio studio in Washington D.C. On this week’s show, Jay and Jordan discuss the San Diego Mt. Soledad cross case and respond to callers’ questions.